Rigaku's ART division specializes in X-ray fluorescence (XRF) spectrometers employing energy dispersive detectors (EDXRF). XRF is an X-ray spectrometric technique for elemental analysis of a wide variety of materials. Other phrases for XRF instruments include: XRF analyzer, XRF spectrometer, XRF analysis, X-ray fluorescence analyzer, x-ray fluorescence spectrometry, fluorescence x, spectromÃ¨tre de fluorescence X, RÃ¶ntgenfluoreszenzanalyse, fluorescencia de rayos X, RÃ¶ntgenfluoreszenz, RÃ¶ntgenfluorescentie, RÃ¶ntgenfluorescens, RÃ¶ntgenfluoresenssi, RÃ¸ntgenfluorescens and Promieniowanie rentgenowskie. Typical uses of EDXRF include the analysis of petroleum oils and fuel, plastic, rubber and textiles, pharmaceutical products, foodstuffs, cosmetics and body care products, fertilizers, geological materials, mining feeds, slags and tails, cement, heat-resistant materials, glass, ceramics, catalysts, wafers; the determination of coatings on paper, film, polyester; metals and alloys, glass and plastic; forensics; multi-layer thin films on silicon wafers, photovoltaics and rotating storage media as well as pollution monitoring of solid waste, effluent, cleaning fluids, pools and filters. In addition, X-ray Transmission (XRT) process gauges are employed to measure sulfur (S) in crude oil and marine bunker fuel. XRF and EDXRF spectrometers are the elemental analysis tool of choice, for many applications, in that they are smaller, simpler in design and cost less to operate than other technologies like inductively coupled plasma optical emission spectroscopy (ICP-OES) and atomic absorption (AA) or atomic fluorescence (AF) spectroscopy. Examples of some common EDXRF applications are: Cement and raw meal: sulfur, iron, calcium, silicon, aluminum, magnesium, etc; Kaolin clay: titanium, iron, aluminum, silicon, etc; Granular catalysts: palladium, platinum, rhodium, ruthenium, etc; Ores: copper, tin, gold, silver, etc; Cement and mortar fillers: sulfur in ash. Other examples of common EDXRF applications include: Gasoline, diesel and RFG: sulfur, manganese, lead, etc; Residual gas oils: sulfur, chlorine, vanadium, nickel, etc; Secondary oil: chlorine, etc; Kerosine, naphtha: sulfur, etc; Crude oil and bunker fuels: sulfur, vanadium, nickel, etc; Plating, pickling & pre-treatment baths: gold, copper, rhodium, platinum, nickel, sulfates, phosphates, chlorides, etc; Acetic acid: magnesium, cobalt and bromine; Terephthalic acid (TPA): cobalt, manganese, iron, etc; Dimethyl terephthalate (DMT): heavy metals; PVC copolymer solutions: chlorine; Photographic emulsion: silver; Clay: metals and non-metals; Waste and effluent streams: RCRA metals, chlorides, phosphates, etc. Additionally, EDXRF and XRF are employed to quantify atomic elements in: Food, pet food and other animal feed: potassium, phosphorus and chlorine; Cosmetics: zinc, titanium, calcium, manganese, iron, silicon, phosphorus, sulfur, aluminum, and sodium; Wood treatment: CCA, Penta, ACQ, ACZA, phosphorus-based fire retardants, copper naphthanate, zinc napthanate, TBTO, IPBC and combinations of these; Antacids: calcium; and Toothpaste: phosphorus and tin. Energy Dispersive X-ray Fluorescence (EDXRF) spectroscopy provides one of the simplest, most accurate and most economic elemental analytical methods for the determination of the chemical and/or elemental composition of many types of materials. The technique is generally non-destructive, requiring little if any sample preparation, and is suitable for almost all sample types. X-ray Fluorescence (XRF) spectrometric analysis can be employed to measure a wide range of atomic elements, from sodium (11) through uranium (92), while providing elemental detection limits from low parts-per-million (ppm) to high weight percent (%wt). In addition to elemental analysis, EDXRF spectrometers may be used to measure the thickness and composition of multi-layer thin films. In X-ray fluorescence (XRF), an electron can be ejected from its atomic orbital by the absorption of a light wave (photon) of sufficient energy. The energy of the photon (hν) must be greater than the energy with which the electron is bound to the nucleus of the atom. When an inner orbital electron is ejected from an atom (middle image), an electron from a higher energy level orbital will be transferred to the lower energy level orbital. During this transition a photon maybe emitted from the atom (bottom image). This fluorescent light is called the characteristic X-ray of the element. The energy of the emitted photon will be equal to the difference in energies between the two orbitals occupied by the electron making the transition. Because the energy difference between two specific orbital shells, in a given element, is always the same (i.e. characteristic of a particular element), the photon emitted when an electron moves between these two levels, will always have the same energy. Therefore, by determining the energy (wavelength) of the X-ray light (photon) emitted by a particular element, it is possible to determine the identity of that element. For a particular energy (wavelength) of fluorescent light emitted by an element, the number of photons per unit time (generally referred to as peak intensity or count rate) is related to the amount of that analyte in the sample. In EDXRF spectroscopy, the counting rates for all detectable elements within a sample are usually calculated by counting, for a set amount of time, the number of photons that are detected for the various analytes' characteristic X-ray energy lines. It is important to note that these fluorescent lines are actually observed as peaks with a semi-Gaussian distribution because of the imperfect resolution of modern detector technology. Therefore, by determining the energy of the X-ray peaks in a sample's spectrum, and by calculating the count rate of the various elemental peaks, it is possible to qualitatively establish the elemental composition of the samples and to quantitatively measure the concentration of these elements. Rigaku X-ray spectrometers may be used in conjunction with Fundamental Parameters (FP) software to allow for elemental quantification of completely unknown samples without standards. 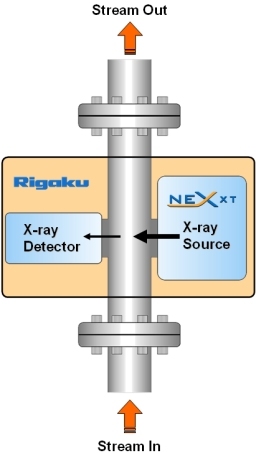 For example, the Rigaku NEX CG energy dispersive X-ray fluorescence analyzer is powered by a new qualitative and quantitative analytical software, RPF-SQX, that features Rigaku Profile Fitting (RPF) technology. The software allows semi-quantitative elemental analysis of almost all sample types without standards â€“ and rigorous quantitative analysis with standards. Featuring Rigakuâ€™s famous Scatter FP method, the software can automatically estimate the elemental concentration of unobserved low atomic number elements (H to F) and provide appropriate corrections. RPF-SQX greatly reduces the number of required standards, for a given level of calibration fit, as compared to conventional EDXRF spectrometric analytical software. As elemental analysis standards are expensive, and can be difficult to obtain for many applications, the utility of RPF-SQX can significantly lower the cost of ownership and reduce workload requirements for routine energy dispersive X-ray fluorescence based elemental analysis. X-ray Transmission (XRT) gauging has long been an accepted technique for the measurement of sulfur (S) in heavy hydrocarbon process streams. Whether used for pipeline switching, crude oil blending or to assay or blend marine and bunker fuels, the Rigaku NEX XT XRT process analyzer is well suited to rigorous process environments, with pressures up to 1480 psig and temperature up to 200°C. X-ray transmission gauging involves measuring the attenuation of a monochromatic X-ray beam at a specific energy (21 keV) that is specific to sulfur (S). In practice, a process stream passes through a flowcell where sulfur (S), in the hydrocarbon matrix, absorbs X-rays transmitted between an X-ray source and detector (see schematic at left). The recorded X-ray intensity is inversely proportional to the sulfur concentration, thus the highest sulfur levels transmit the least X-rays. As illustrated in the table, 21 keV is chosen as the energy of X-rays employed in the measurement because: 1) the molar absorptivities of C and H are almost identical and 2) the absorption due to sulfur is 14X larger than the CxHy matrix and 7X larger than oxygen. Thus the method is insensitive to changes in the C:H ratio and is primarily sensitive to only the sulfur content. Established in 2009 as the "Energy Dispersive X-Ray Fluorescence "Center of Excellence" division of Rigaku Corporation, Applied Rigaku Technologies, Inc. (Austin, Texas, USA) is responsible for the engineering and production of Rigaku EDXRF products worldwide. At the PittCon 2013 exhibition in March in Philadelphia, ART accelerates our pace on innovation with the introduction to the world of our fifth new product: the Rigaku NEX OL on-line process elemental analyzer. The company designs and manufacturers benchtop EDXRF elemental analysis instrumentation for non-destructive analytical chemistry applications, including atomic spectroscopy (spectrometry), quantitative and qualitative elemental analysis. 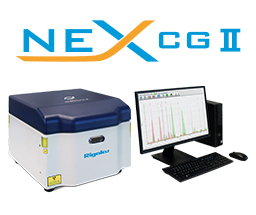 Current instruments include the state-of-the-art polarized (cartesian geometry) Rigaku NEX CG EDXRF spectrometer and the new lost-cost Rigaku NEX QC and NEX QC⁺ elemental analyzers. 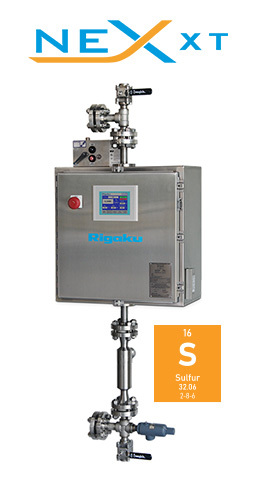 In addition, ART offers a third generation X-ray Transmission (X-ray Absorption) process gauge (NEX XT) for the determination of sulfur (sulphur) in a wide variety of heavy viscous hydrocarbon matrices, including bunker fuels, crude oil, and residuums. Since its inception in 1951, Rigaku has been at the forefront of analytical and industrial instrumentation technology. Today, with hundreds of major innovations to their credit, the Rigaku Group of Companies are world leaders in the fields of general X-ray diffraction (XRD), thin film analysis (XRF, XRD and XRR), X-ray fluorescence spectrometry (TXRF, EDXRF and WDXRF), small angle X-ray scattering (SAXS), protein and small molecule X-ray crystallography, Raman spectroscopy, X-ray optics, semiconductor metrology (TXRF, XRF, XRD and XRR), laboratory automation, X-ray sources, computed tomography, nondestructive testing and thermal analysis. 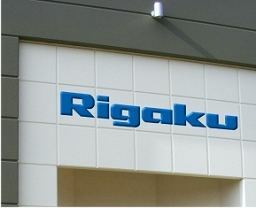 Rigaku employs over 1,400 people worldwide in operations based in Japan, the U.S., Europe and China. We value our people. Our value comes from them. Close collaboration between our users and employees sets the direction and focus of our work, allowing us to address customers' needs and stay close to the market place.